The New Hi line is an exciting new model which with the benefit of Ford’s Kenetic design manages to balance a subtle roof line with a pragmatic interior, The Hi-line is a more affordable option than the traditional Pop top and 5 overhead lockers provide “organised” multiple storage solutions. The permanent fixed roof offers greater comfort and really comes into its element through the colder months. This Camper wins your heart and your head. We are delighted to have won such a prestigious award. The judges felt our Camper stood out because it was the most Innovative and well executed genuine multipurpose vehicle they have seen. 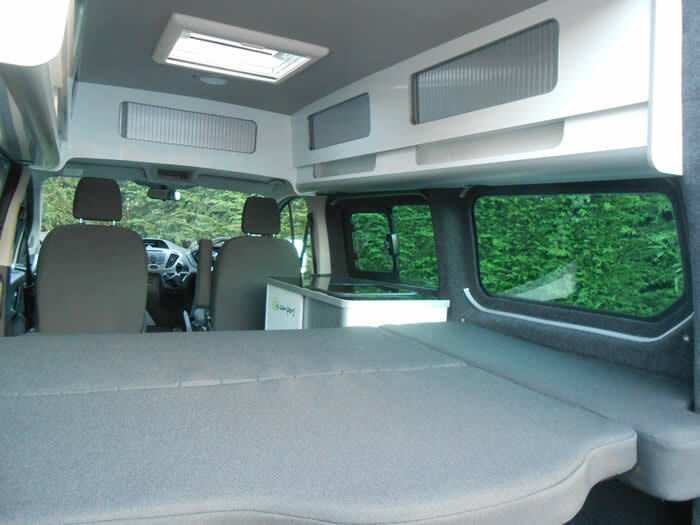 No other conversion they have saw could offer up to 8 comfortable seats or provide such a large bed and simply transform from one format to the next. After 10 years in the Leisure industry we take this award as a massive endorsement and take great pride in that our philosophy of Innovation, quality and value has been recognised. 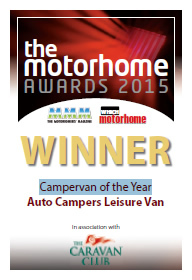 With the New Leisure Van due in February 2015 we look forward to a busy year! Mr & Mrs R thought they had to wait for the new Leisure Van, however once they spent time with us setting the Day Van up in different configurations it became obvious their need for 2 boats on the roof and a large boot led them to the Day Van – The twist was, we found the top wardrobe unit sits on top of the telescopic cross beams, giving them a full width boot accessible from the rear doors and habitation space, together with the top wardrobe unit giving easy access to kitchen and everyday bit & bobs. Plus 4 can travel in full width comfortable travel seats & they sleep soundly on a 4’3” x 6’1” bed. Customer feedback is invaluable and allows us to evolve our Campers. The one thing we learnt from the NEC was our model names were to complicated. Moving forward our current model range with 3 roof heights will all be called “Day Vans”. The Day Vans will be defined by their 2-8 travel seats, 2-4 berths, removable modules and over 200 combinations. Delighted and exhausted following the launch of the new day van last week at the NEC. Both low line and pop top demonstrators were exhibited to press and visitors with an emphasis on illustrating lifestyle with props and the help of multiple TV screens. The innovative concept of eight travel seats and removable modules was greeted with interest and enthusiasm, more road test information coming soon. Niall Hampton Editor of Practical Motorhome taken Leisure Van for Road test and review, Initial comments very Innovative and well built – Look out for report to be published soon. 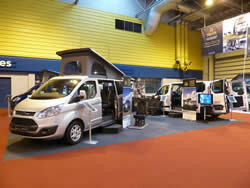 New Transit Custom Auto Camper Leisure Van is launched at the NEC. Excellent media and visitor attention surrounding New Hi-line model exhibited, 2 magazine road tests booked already and very positive show feedback recognising the unique compact body profile and surprisingly flexible storage. The King size bed and zoned kitchen and dining areas received equal comment. 2014 Transit Custom Kombi Auto Camper prototype furniture now complete and floor plan confirmed. 1st Medium roof base vehicle expected mid December and consumer opinion being sought for further evaluation, please contact us to arrange a pre Feb launch visit. Official launch due at the Caravan & Campng show 18-23 Feb 2014, come and see us on the Wellhouse Ford stand. Roy Wood Transits take orders for new Wellhouse Ford Tourneo elevating roof conversion at the NEC. Roy Wood Transits are delighted with their appointment. As the Southern dealer for the new Ford Tourneo Wellhouse Conversion, Managing Director Steve Wood believes the Affordable Auto Camper and highly specified Wellhouse conversion gives customers a wider choice of Great value Campers based on the award winning Transit Custom.